The Virginia Tech Hokies Basketball team will open the 2012-13 schedule on Saturday, Nov. 10 against East Tennessee State in Cassell Coliseum in the debut for new head coach James Johnson. The game will be the first of three consecutive home games. Virginia Tech will also play Rhode Island on Nov. 12 and renew its rivalry with VMI on Nov. 15. The Virginia Tech Hokies Basketball team will host Iowa on Tuesday, Nov. 27, as part of the 14th Annual ACC/BigTen Challenge, in a game televised by ESPNU at 7:15 p.m. The Hokies will play key non-conference games against Oklahoma State in Cassell Coliseum on Dec. 1 and will renew their series with West Virginia, in Morgantown on Dec. 8. The Hokies will also travel to Salt Lake City on Dec. 29, as they will play BYU in the EnergySolutions Arena, home of the Utah Jazz of the NBA. The Virginia Tech Hokies Basketball Team will participate in the Continental Tire Las Vegas Classic in December. Tech opens play on Dec. 10 against 2012 NCAA Tournament participant Mississippi Valley State in Cassell Coliseum. Virginia Tech’s other opening round game will be on Dec. 15 at home against Georgia Southern. All teams will advance to Las Vegas, where the Virginia Tech Hokies will compete on Dec. 22 and 23 at the Orleans Arena. 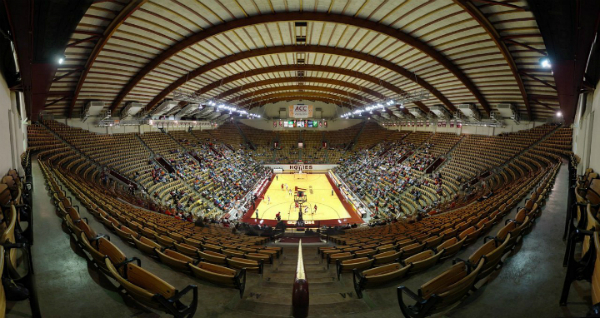 The Hokies will play Bradley on Dec. 22 and either Colorado State or Portland on Dec. 23. Other non-conference games on the schedule include a home game with Appalachian State on Friday, Nov. 23 and a road game at UNC Greensboro on Monday, Nov. 19, in the Greensboro Coliseum, site of the 2013 ACC Tournament.